The interior of a vehicle is just as important to the driver of a vehicle as the exterior is. 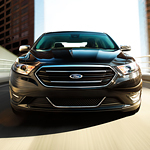 You will be happy to know that the interior of the Ford Taurus is put together with quality materials. The interior of this vehicle is something that was well thought out before it was created and it is special.